Being social has it's perks. I'm known for spending a lot of time on Twitter, Facebook, my blog, and other social networking sites. Some of my less-than-social-savvy friends and family think it's insane the amount of time I invest. But I know that eventually, if it hasn't already, this "investment" will pay off. June 30, 2011 was deemed Social Media Day, or #SMDay on Twitter. As always, I was being "social" by checking out my Twitter stream. I discovered a contest from Four Seasons Hotel Washington, DC for a chance to try their summer brunch. I wasted no time following the simple rules of re-tweeting their tweet. As it turns out, I won. I was immediately contacted by the hotel's social media manager. She was nothing but pleasant. Our phone conversation went great and we were able to make reservations that same week for me to visit their location. If you know anything about me and my "habits", you would know that I have a love/hate relationship with breakfast. If I eat too early, I feel nauseous. If I don't eat at all, I feel nauseous. So brunch is the perfect solution to end my breakfast woes. I was more than excited to try all the items on the menu. 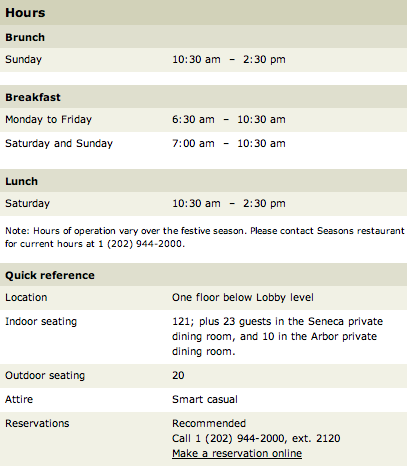 The summer brunch hours are from 10:30 AM to 2:30 PM. We arrived at just a little after 1:00 PM. As we pulled around the brick building, surrounded by strategically-place shrubbery and picture-perfect landscaping, a valet attendant greeted me promptly at my car door. He asked if I was there for the summer brunch and gave me some information on validating my ticket before insisting I had a "wonderful time". 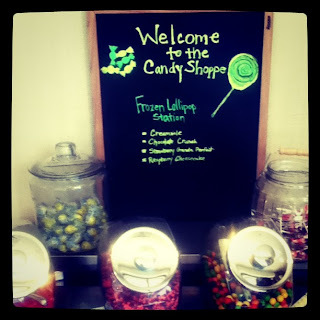 I grabbed my sweater, and walked toward the revolving doors leading to the lobby. The lobby was just as I pictured it would be— pristine, marble floors, friendly faces, and gorgeous flowers to compliment the earth tones on the walls and floors. I had an idea of where we were going because I read on the website the exact whereabouts of SEASONS, the hotel's restaurant. It was one floor below lobby level. Warm and inviting were the two words I would use to describe how I felt upon entering Seasons. The hostess welcomed Ian, Kaden, and me immediately. She was very pleasant. That helped set the mood for the rest of the afternoon. We wasted no time getting settled. A table was waiting for us just beside the window, with a view to the surrounding area. It was perfect. Kaden even asked me if the plants were real. I guess he wasn't used to seeing an entire wall of plants inside of a restaurant. Our first stop was at the seafood station. We wasted no time testing out the taco stand soon after. There was also a carving station, a cheese station, breakfast station, and a country-themed display of market salads. During our entire visit, the staff was wonderful. There was never a moment where I was looking for someone to assist us. It almost felt as if we were in the restaurant alone. There was no shortage of service and constant attention. I joked that I don't know if I could ever live that way, having someone at my every beck and call. Both Ian and Kaden laughed because they knew that I would totally enjoy a lifestyle like that. Secretly, I would. What girl wouldn't?! Thankfully, I had Sami. He gave us information about the hotel, the restaurant, and other tidbits. I tried getting him to give names, but he wouldn't budge (you know, privacy and all). I kept looking at the door to see if Oprah would walk in. No luck! Sami asked us about our family and seemed genuinely interested. He never rushed the conversation. It felt like we knew him. There were other employees that we talked to during our visit, but I can't remember their names. I remember one of the staff having a conversation with Kaden about soccer. Kaden really enjoyed that. And who could forget the bottomless Mimosas. My glass was filled each time it hit the halfway point. I had a bit of water and orange juice as well. I didn't want to get too "relaxed". I didn't eat nearly as much as I would have liked. But I did save enough room for dessert. And boy was it worth it. The Four Seasons Hotel summer brunch includes an entire room dedicated to nothing but desserts. When we walked in the room, it almost mirrored a museum. There were carefully-crafted, yummy treats on a table in the center of the room. It was quite overwhelming. I could not decide what to choose, or whether the dessert was too "pretty" to eat. That was the icing on the (cup)cake for me. It was a wonderful way to end my visit at the Four Seasons Hotel in Washington, DC However, the best was yet to come. Before we were ready to head home, one of the staff members brought out a plate with Twitter-themed cookies and macaroons. How "sweet" was that?! The service still did not stop there. A staff member came over to validate my parking ticket and called the valet to make sure the car was waiting when we arrived outside. It was. The door were opened, and we hopped in with stuffed stomachs and happy faces. It was a wonderful day. I would also add that the cost is $80 per person (children prices vary, so I would call to get a quote). I would also recommend you do not eat a lot before attending. After all, you'll want to try everything during your visit. And, for all you techie people, the Four Seasons Hotel can provide you with a Kindle during your visit so that you can enjoy a bit of reading. Neat! I am blessed to have been treated so well and to be able to bring my family along for the experience. Four Seasons Hotel is not only 5-star, but it's also two thumbs up! 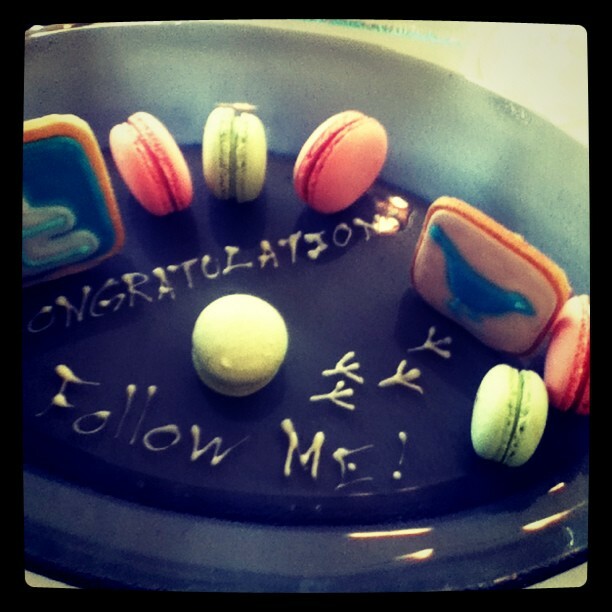 Follow FOUR SEASONS HOTEL on Twitter at @FSWashington & on Facebook at FOUR SEASONS HOTEL WASHINGTON DC. 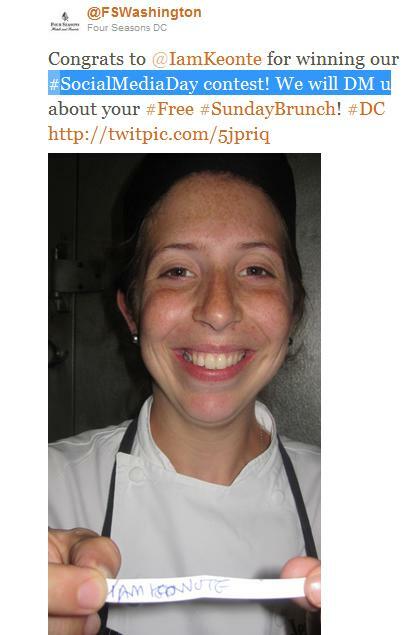 Disclosure: I received a complimentary summer brunch for two people for winning a Twitter contest. 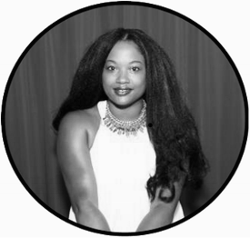 I was not obligated to write about my experience, but I wanted to share it with my readers. The opinions and views are my own. Wow! This looks incredible, and I love your vivid descriptions of everything! 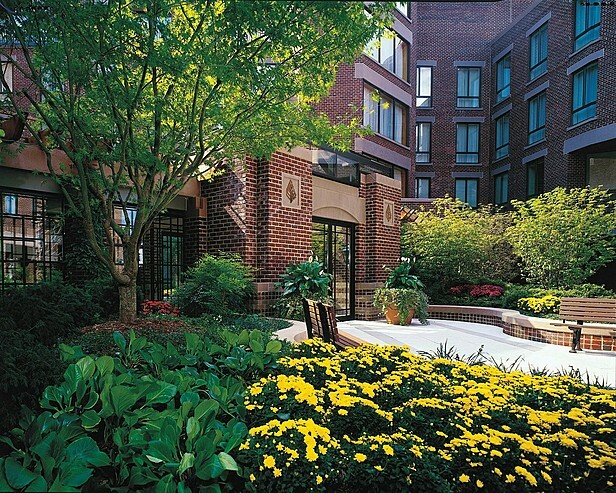 My family is planning a trip to the Four Seasons Washington, DC later this summer and now I'm even more excited to try their Sunday brunch! Thank you!!! @ Monica@MacaroniKidNYC It was. We didn't have the luxury of staying at the hotel, but the summer brunch was a great introduction to all its fabulousness. Hope your family enjoys their trip.